Very nice breakfast, comfortable mattress, and quiet room! Good area w/ lots of places to eat. Laundromat nearby. Clean, quiet, and comfortable. Good value for the price. Bed was comfy, shower good. Reception were happy to provide coffee etc during the evening. Good location just out of the city centre so quiet. Staff opened the bar for us when we got back late. The room was pretty comfortable, very clean, everything looked like new. It also was quiet enough which is always very important for a traveler. We arrived a bit earlier the check-in time but we could leave all our bags in a special room and go for a walk without them. That was nice. Friendly staff, they are really helpful. The rooms are quiet. Perfect for stay if you travel to south of France. On 2/3 of the trip and 200m away from the main highway. Hôtel Axotel Lyon Perrache is located on Lyon’s Presqu’île, a 6-minute walk from Perrache train and metro station. It has a traditional restaurant onsite as well as a shaded terrace and garden. Free WiFi is available throughout the property. 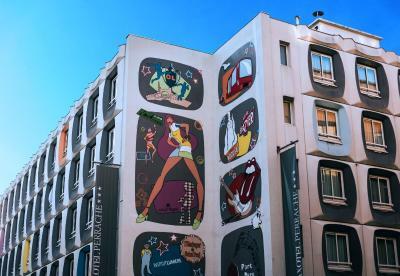 All the guest rooms at the Hôtel Axotel Lyon Perrache are air conditioned and have a private bathroom, and flat-screen TV with satellite channels. A buffet breakfast is served every day. Guests can enjoy billiards or relax with a drink during the evenings in the hotel bar or on the terrace. 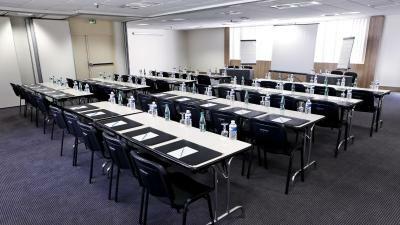 Set in the heart of the city, the hotel is 2,650 feet from Place Carnot and the E15/A6 motorway. The old town and Saint Jean Cathedral are 1.6 mi away. The tramway stop Suchet is 650 feet from the property. 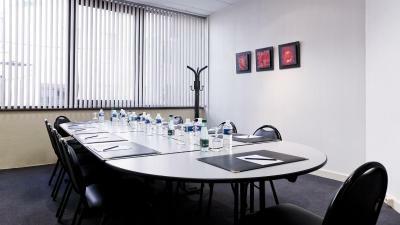 The property offers a preferential rate at the public parking, available a 4-minute walk away. 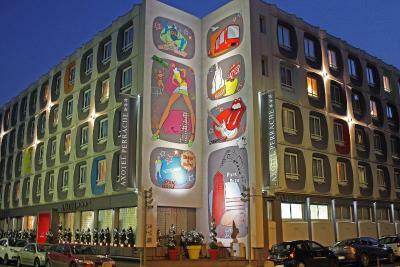 When would you like to stay at Hôtel Axotel Lyon Perrache? Decorated with bright colors, this air-conditioned room has a private bathroom. Flat-screen TV with satellite channels and free Wi-Fi access are provided. Extras in the superior rooms have additional space. This family room has a flat-screen TV, soundproofing and air conditioning. Hotel surroundings – This neighborhood is a great choice for travelers interested in shopping, food and restaurants – Check location Good location – show map Guests loved walking around the neighborhood! House Rules Hôtel Axotel Lyon Perrache takes special requests – add in the next step! Hôtel Axotel Lyon Perrache accepts these cards and reserves the right to temporarily hold an amount prior to arrival. 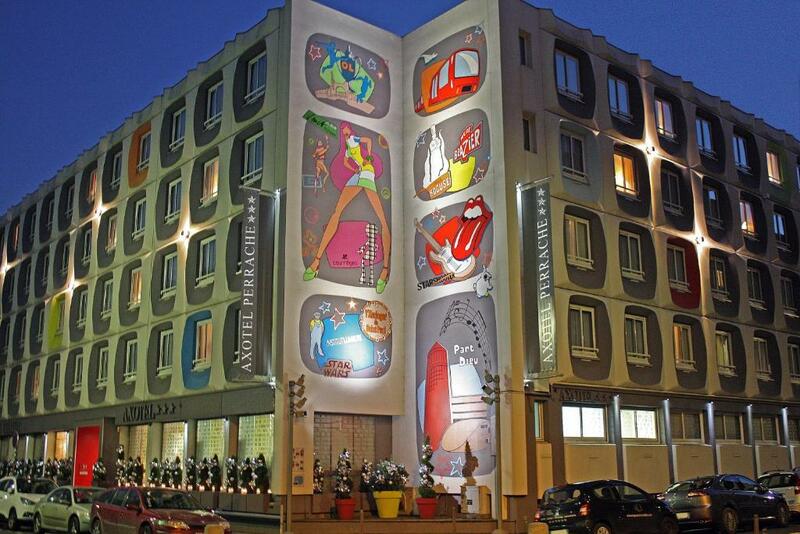 Please inform Hôtel Axotel Lyon Perrache of your expected arrival time in advance. You can use the Special Requests box when booking, or contact the property directly using the contact details in your confirmation. Steps to front entrance to carry heavy suitcase up. Then steps to another floor to be able to use elevator inside hotel. No room at end of bed to get suitcase past where table stand was. No tea or coffee facility in the room. Very small room and bathroom. Not the same Room as on the pictures, it was uglier and smaller than expected. Ugly and dirty neighbourhood. The staff was looking like they're not happy to see us. I mean maybe they don't have to pretend like we're their dearest guests but I felt like I irritate everyone just by arriving and saying hello. Sorry for disturbing then! Despite everything in the room was nice and worked well, I woundn't say it really worth this money. The breakfast was also too expensive, you can have it in many local places not far away twice cheaper (that's how we did). Also, the hotel makes a preauthorization on your card and I know, many hotels do that but I totally hate the fact it looks like they have already took the money and then take the money again while that first sum is blocked and you can't use it and have to wait WEEKS for having it back. So strange. The breakfast itself is okay but the dining room is too small. Clean room with aircon an extremely comfortable bed. Lovely breakfast room with plenty of choice of fresh food and beverages. Well serviced and very clean.